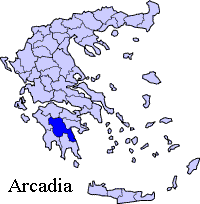 Arcadia or Arkadía (Greek Αρκαδία) is a region of Greece in the Peloponnesus. It takes its name from the mythological character Arcas. Due to its remote, mountainous character, Arcadia has always been a classical refuge. So during the Dorian invasion, when Mycenaean Greek was replaced with Doric Greek along the coast of the Peloponnes, it survived in Arcadia, developing into the Arcadocypriot dialect of Classical Antiquity. Arcadocypriot never became a literary dialect, but it is known from inscriptions. Tsan is a letter of the Greek alphabet occurring only in Arcadia, shaped like cyrillic И; it represents an affricate that developed from labiovelars in context where they became t in other dialects. 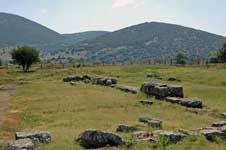 One of the birth-places reported for Zeus is Mount Lycaeum in Arcadia. Lycaon, a cannibalistic Pelasgian king, was transformed into a werewolf by Zeus. Lycaon's daughter was Callisto. 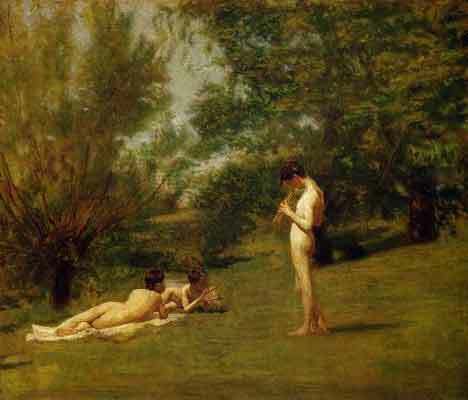 Arcadia remained a rustic, secluded area, and its inhabitants became proverbial as primitive herdsmen leading simple pastoral unsophisticated yet happy lives, to the point that Arcadia may refer to some imaginary idyllic paradise, immortalized by Vergil's Eclogues, set in Arcadia, see also Arcadia (paradise). Even in Arcadia, there am I... These words, issuing from the tomb, sadden their faces, and the smiles die upon their lips. 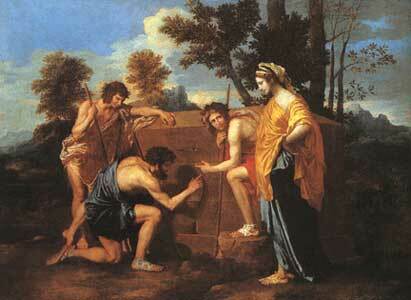 The phrase Et in Arcadia ego goes back to a 1647 painting by Nicolas Poussin, also known as "The Arcadian shepherds". where it appears as an inscription on a tomb. Name of inhabitants: Arcadian sing. Arcadia's has its present-day capital at Tripoli. 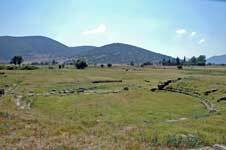 It forms the largest prefecture on the Peloponnesian peninsula. It currently covers about 18% of the entire peninsula, although it once extended to about 20 to 25% of the peninsula. The prefecture has a skiing resort on Mount Maenalus, the Mainalon, located about 20 km NW of Tripoli. The other mountains include the Parnon in the southeast, the Saita, the Skiathio, the Lykaia and Tsiberou. The GR-7, E65 freeway, which was extended after 1997 and in 2003, runs through Arcadia on a north-west to south-east axis and nearly forms in the southwest the end of the freeway. A nuclear and coal power station which produces electricity for most of southern Greece, operates to the south of Megalopolis, along with a coal mine. 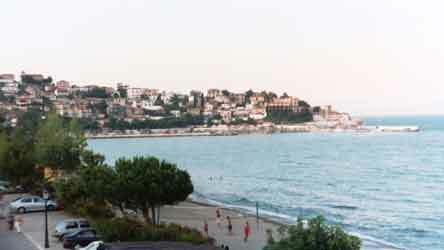 The chief cities and communities in the prefecture include Tripoli, Astros, Vytina, Dimitsana, Lagkadia, Leonidi, Leontari, Levidi, Megalopolis and Stemnitsa. In agriculture, potato farms, mixed farming, olive groves, and pasture dominate the plains of Arcadia, especially in the area around Megalopolis and between Tripoli and Levidi. 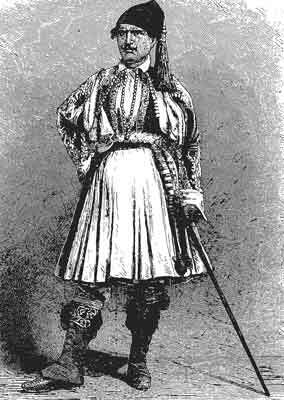 Theodoros Kolokotronis (1770 - 1843), a general in the Greek War of Independence (1821 - 1832), lived in Arcadia. 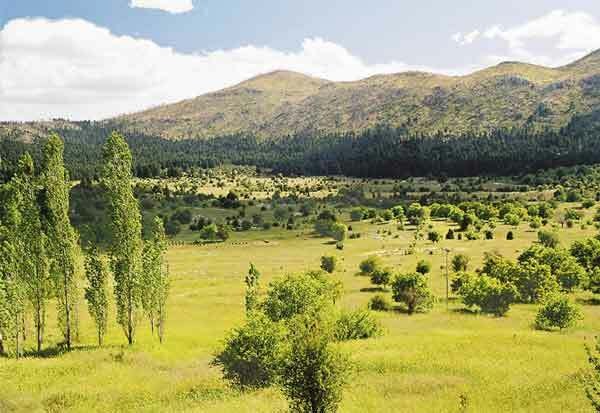 Its climate has hot summers and mild winters in the eastern part, the southern part, the low lying areas and the central part ald area lower than 1,000 m. The area mainly receives rain during summer and winter months for most of the time in the rest of Arcadia. Winter [snow?] occurs commonly in the mountainous areas for much of the west and the northern part, the Taygetus area, the Mainalon. In the 20th century, Arcadia experienced extensive population loss through emigration, mostly to the Americas. Many Arcadian villages lost almost half their inhabitants, and fears arose that they would turn into ghost towns. Arcadia now has a smaller population than Corinthia. Demographers expected that its population would halve between 1951 and the early 21st century. In the mid to late 20th century a power plant began operating. 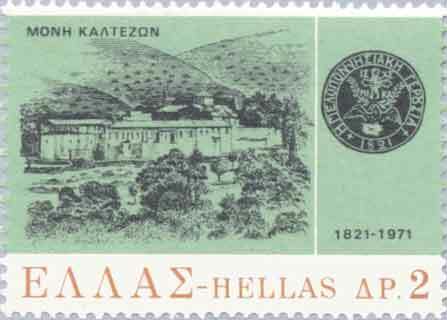 This exludes the independent commune of Kosmas (municipal code: 0511, postal code: 230 58) where the seat is Geraki.